Reprinted from University of California at Santa Barbara Economic Forecast 2009. Written by Greg Stafford, Steve McCarty and Steve Davis of Stafford-McCarty Commercial Real Estate. The downward trend projected last year has become a vivid reality for the City of San Luis Obispo. Last year the number of sales in the 3rd quarter was 144 single family units within the City of San Luis Obispo. This year the number is 102 units sold. A 29% decrease in sales. The median price a year ago was $547,000, this year $500,000. appears to be buyer confidence at the lower end of the housing market. Seismic retrofit is extremely active in the Downtown core. Papered windows and smoke glass mask the interior work. There is little, if any, availability excluding the former 4,200 square foot Leon’s Bookstore space on Higuera which sold this year and is completing its retrofit. Multiple proposals have been made for this space. Recent transactions for central downtown. As discussed last year, a new rental paradigm is continuing to emerge. Newly retrofitted buildings are achieving market-high rents evincing the large spread between existing rents which have been little changed over the last fifteen years and are typically under $2.00 per square foot and retrofitted buildings which are commanding rents between $2.00 and $3.00 per square foot. Well located spaces have achieved high watermark rents exceeding $4.00 per square foot. Investors are continuing to pay higher prices for downtown properties ($400 to $700 per square foot). This translates into higher rents and results in more national and regional tenants as opposed to local tenants. Vacant downtown land or land with a “tear-down” building is approximately $250 per square foot. Although no large projects are currently in the building phase, there are numerous mixed use projects (Vaquero 32,000 square feet, Garden Terraces 35,000 square feet of commercial space and the Chinatown Project with 50,000 square feet of commercial space—the latter two having hotels) in the downtown core having multiple stories, retail on the ground floor and residences on the upper floors. These projects face some tough hurdles with 1) changing public interests (and subsequent mitigations) from the community, 2) securing access to credit as lenders are shying away from projects with residential components and 3) finding tenants in a down economy. Running contrary to the general feeling and press regarding weak retail markets, the retail sector continues to demonstrate low vacancy rates of approximately 2.97 percent for the overall market. This is still a relatively low rate, but it is an increase from 1.4 percent as of our October 2007 reporting. There is approximately 117,690 square feet of retail space available within the San Luis Obispo market. However, as this article is being written some national retailers are feeling the effects of the economic downtown and have indicated they will be closing local stores in 2009 (Linen & Things and Mervyns). Broad Street Village has had several sales around $375 per square foot for units in the 4,000 square foot range. Existing buildings just outside or near downtown are selling for approximately $350-650 per square foot. Presently, office vacancy has crept up from 3.5 percent to 6.05 percent with an inventory of approximately 158,555 square feet. Free rent and large tenant improvement contributions are part of current deal making. Second generation unit rents have dropped 20 to 40 cents per square foot. Active projects and completions: Airport Business Center recently completed approximately 23,000 square feet for Performance Gymnastics. Additional pads for expansion have been created but no speculation building will be done at this time. The Tank Farm Commerce Park continued construction of 34,000 square feet along Tank Farm Road and 15,500 square feet along Suburban Road. Occupancies this year include Kelly Moore Paints, Stephen Ross wines and LifeCare. Stated rental rates are approximately $1.85 per square foot triple net with the owner delivering a finished vanilla shell. WestPac Development has begun construction on their office and medical project on Aerovista and is also under construction on 22,000 square feet of their Phase I Railroad Square. Manufacturing, once an index to a community’s economic health, has become less and less of a factor. Traditional spaces have been absorbed by more entrepreneurial and creative (software and services sector) ventures changing the large open bays into softer office-like workplace environs. Noticeable examples are the conversions of the Performance Technologies on Southwood Drive into Cannon Engineering’s headquarters. Thus, associated manufacturing job market sector employees are shifting into office, services and retail or leaving the area. The vacancy rates for manufacturing product has risen to 5.35 percent from 2.3 percent in 2007 but still remains relatively stable. San Luis Obispo’s manufacturing inventory is approximately 3,692,803 square feet. The area in the vicinity of the airport is poised for expansion with numerous finished lots suitable for larger warehouse and office buildings to be constructed. To date only one of the twenty-plus lots has started construction. The Central Coast investment markets continue to soften with anticipation of rising capitalization rates, although we have not yet seen comparable sales to support this increase. Tax deferred driven transactions have been few as well as a paucity of inquires. Minimal investment sales have transacted this year, although property acquisition opportunities are emerging. Properties which have “not” been for sale have changed to “may” be for sale at certain price points. There is not a market ubiquitous cap rate. Each transaction is a case by case basis, with the buyer having their own basis for determining value. 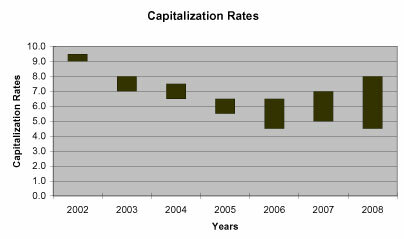 However as a general rule, when interest rates increase so do the capitalization rates. The following sales represent the majority of income property sales transacted since the last reporting within downtown San Luis Obispo. This smaller community on the Central Coast has been bursting with commercial activity the last several years. Paso Robles has added significant amounts of square footage for a community with a population base of approximately 30,000. Correspondingly, this year’s vacancy has increased over all market segments. Residential foreclosure sales dominate market activity. Data supplied from Fred Bruen of REMax Parkside indicate single family home sales in the North county markets are up 26% from last year (249 versus 197 transactions). However, the median price is $385,000, greatly reduced from last year’s median of $472,500. Volume is up and prices are down. Last year, downtown block sized areas of land sold for record high values in the $70 per square foot range. A year ago there was hardly a hint of vacancy. Retail expansion continued as 20,400 square feet was added. The present inventory base is 241,180 square feet. The Regency project on Highway 46 and Golden Hill Road started construction. Announced tenants are a 139,300 square foot Lowe’s and a 27,000 square foot Bed Bath and Beyond. Retail is demonstrating weakness after many years of absorption. There is approximately 18,652 square feet of retail space on the market at this time. The recently completed Mee Memorial Medical Office Building consisting of 23,300 square feet at 416 Spring Street lost its tenant and may be re-tenanted shortly according to the owners (this vacancy was not included in this year’s numbers). As the bulk of the medical office supply resides in neighboring Templeton around the hospital, this has become a significant asset serving the Paso market. Industrial vacancy has increased. Vacancy now stands at 7.46 percent up from 2.8 percent last year. This increase in vacancy is due in part to the completion of 228,000 square feet of industrial space this past year which, when combined with the shrinking economy, has resulted in excess inventory. In general, the bulk of vacant space is in newly constructed buildings. Occupancy in established industrial areas remains strong. Several multi-tenant industrial projects have been completed, ranging from approximately 5,000 square feet to 105,000 square feet. Winery expansions continue. Justin Winery has just broken ground on Wisteria in the Golden Hills Business Park. Commercial loans have always been critical factors in successfully transacting real estate sales. Dialog with lenders indicate that loans will undergo much higher scrutiny. Aside from sound borrower history, lenders will require more equity (cash in the transaction), the amount loaned given the value of the property (loan to value ratio) will be lower. The quality, type and age of the property will be part of the lender’s loan equation. Not all properties will be financed. Older properties may be difficult to or excluded from financing. A comment from a commercial lender, “We’re being told to be picky, picky, picky”. The impacts of lender concerns, liquidity issues and decline of values in the residential market are showing signs of creeping into the commercial market. San Luis Obispo vacancy has increased but is demonstrating more stability than the outlying cities. 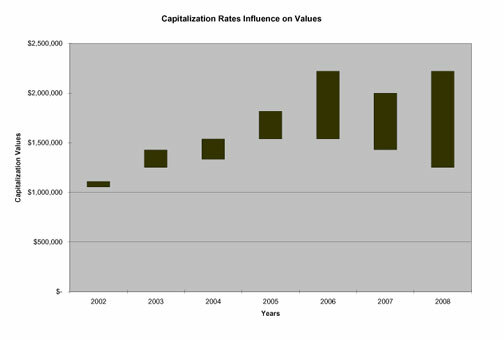 Increasing interest rates are anticipated to drive capitalization rates higher. The saying, “Cash will be King” will become more significant over the next year given market uncertainty. Compared to recent stock market losses will there be a move back to investment real estate?